Hello, merry readers! It's been a week since I've posted - what a delinquent I've become! 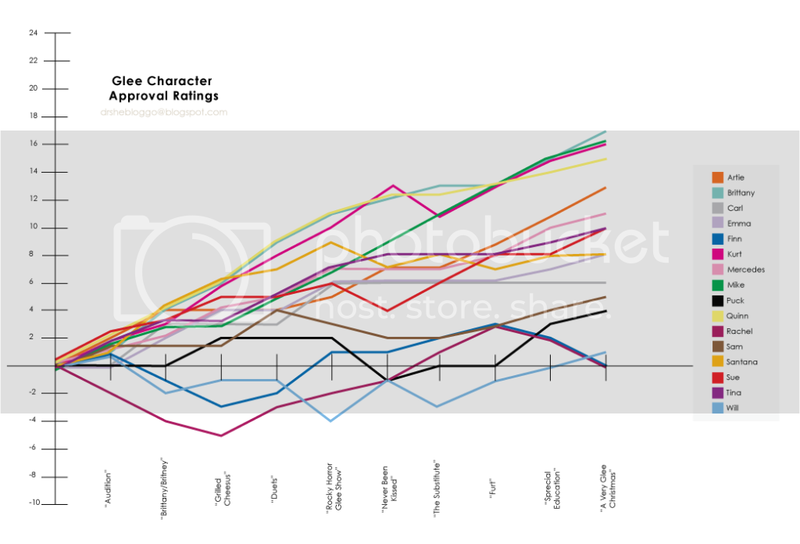 I must make it up to you, first in the form of an updated chart of Glee Character Approval Ratings. Things of note: Brittany continues to lead the pack in likeability, with Kurt not too far behind. But lo! Mike Chang has skyrocketed into Top 3 material! He has slowly and steadily climbed in recent weeks! Quinn's ascent has slowed some, perhaps due to her sudden gooey romance with Sam. I also want to point out that due to mere coincidence, Sue and Tina currently share the same likeability rating, as do Santana and Emma. I'm not sure what to make of that, on a grander scale, but it makes me giggle. Puck is pulling himself up by his bootstraps after his big "Never Been Kissed" drop, and Will ups and downs more than a yo-yo in the hands of a six-year-old. I refuse to take sides in the Finchel break-up, so Finn and Rachel's changes have been the same in recent weeks, and they currently sit right back at 0, where they started the season. That's fitting, I guess. Again, these are all my silly opinions based on how much I approve of certain characters on an episode-to-episode basis. I'm not quite sure how Artie managed to sneak into 5th place though. I remember being a little mad at him lately. Oh well. I promise I'll be back again before another week crawls by! Glee fans, look for an update on Quinn Fabray, and little ode to Tina Cohen-Chang. And if I get really ambitious, I might tackle some shipping woes. But those usually end in me wanting to chuck things at the wall, so for the safety of my possessions, I might have to refrain. Cool graph. I was going to ask, "How can I vote on this?" until I realized these are all just your personal approval ratings. :) Keep up the great blog!